SRI LANKA THE SPICE ISLAND - Ultra International B.V.Ultra International B.V.
Sri Lanka (formerly Ceylon), “Pearl of the Indian Ocean”, is an island at the southern tip of India with a population of 21 million. It has a diverse environment, magnificent cultures and scenery, and a history stretching back thousands of years. The island’s central mountainous area flattens down to the sea, and has diverse climatic zones facilitating production of many aromatic plants, some of which are further processed into essential oils and oleoresins. The principal spices are cinnamon and citronella in the southern coastal belt; pepper, cloves, nutmeg and cardamom in the central hills, especially around Kandy and Matale. Small amounts of ginger, patchouli, vanilla and sandalwood are grown, but processing sandalwood is currently illegal. 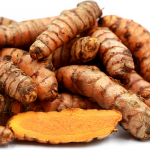 Spices and essential oils is an important sector in Sri Lanka. 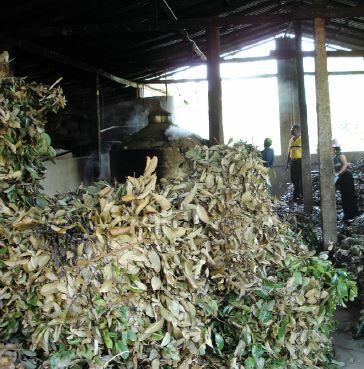 After tea, the sector generates the largest agricultural foreign exchange earnings and in excess of 90,000 hectares (ha) of the wet zone is under spices. Cinnamon, along with pepper, is the dominant spice crop and the only spice grown in Sri Lanka as a mono-crop in the southwest region. Growers range from smallholders with 1 ha or less to plantations up to 200 ha. Smallholders own most of the cinnamon cultivated land, with an estimated 80% grown on land below 1 ha. 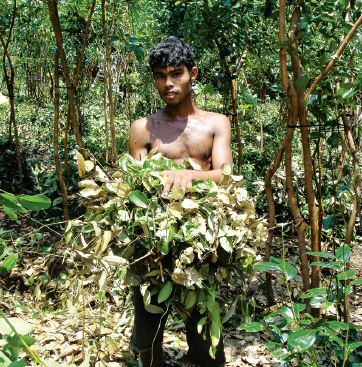 An estimated 250,000 cinnamon cultivators and 400,000 cinnamon sector employees and 60,000 family units are directly dependent on the cinnamon industry as their main income source (C. Perera IFEAT Conference 2015). In terms of farmers’ agricultural returns, cinnamon ranks second in importance to tea. The area under cinnamon has been increasing, totalling an estimated 32,682 ha in 2016 (see Table). In recent years there has been a growth in organic cinnamon production by both plantations and smallholders covering approximately 1,200 ha of certified organic land. A range of commercial products is obtained from cinnamon including quills, chips, featherings, leaf oil, bark oil and root oil. The bark yields oil with high cinnamic aldehyde content, while the leaf consists of eugenol and the root has a high percentage of camphor. There are two kinds of cinnamon: Ceylon (or Sri Lankan) cinnamon (Cinnamomum zeylanicum and Cinnamomum verum) and cassia cinnamon (Cinnamomum cassia Blume (Lauraceae) primarily from China and Indonesia. The Ceylon variety is referred to as the “true” or “real” one; but in reality both are from the same family. Nevertheless, compared with cassia, Ceylon cinnamon contains far lower amounts of naturally occurring coumarin, which can pose toxicity risks. Also, as a medicinal herb, Ceylon cinnamon is better researched, especially in its extract form, than cassia. For example, researchers know more about the anti-bacterial properties of Ceylon cinnamon. for land use and alternative economic and employment opportunities. Bark oil is usually distilled from quillings, because of their lower cost. About 10-12 distillers, both small distillation operations located in the growing areas, and large companies using modern equipment, carry out distillation. Traditionally the oil was extracted using hydro distillation and copper stills were used but these have now been replaced by stainless steel stills using steam distillation and supercritical fluid extraction. Competition exists for raw materials between bark oil distillers and cinnamon exporters. Higher cinnamon prices have encouraged harvesting more than once a year and this has affected both quality and yields. Yields are now rarely above 0.7% compared with over 1% previously with cinnamic aldehyde content of over 65%. Bark oil prices largely depend on the raw material used in distillation; fresh cinnamon quills produce better quality oil. While cinnamon bark oil contains 90 major components and 50 unidentified components, quality is measured by the oil’s cinnamic aldehyde content (i.e. graded 40%, 50%, 60% and 70%). The higher the content, the better the quality and the higher the price. Age, soil, climatic conditions and location can affect quality. The oil has a characteristic powerful spicy, tenacious cinnamon odour, and a yellowish or brownish colour that darkens when exposed to air. Its main uses are in food flavouring, beverages, perfumes, cosmetics, and pharmaceutical preparations. Exports of bark oil from 2014 to 2017 show an upward trend reaching 47 MT in 2017. Most cinnamon bark oil is exported directly by 3 or 4 of the large distillers or by commodity exporters, who purchase from small-scale distillers. The off-season for cinnamon is from January to April, and this, combined with the dry weather during the first quarter of 2018, has reduced raw material availability, putting upward pressure on prices. The limited availability of oil until at least late May will ensure that prices remain firm. Cinnamon leaf oil is a by-product from processing cinnamon bark into quills. After harvesting the bark, the leaves, twigs and tender stems are trimmed and left in the field. After wilting for 3-4 days, the leaves are collected in 40 kg bundles and transported to the field stills for steam distillation. One hectare yields approximately 7 MT of raw material and each distillation uses approximately 350 kg of material. Distillation takes 6-7 hours and the yield is approximately 1% and is carried out solely by small operations within the growing area. There are about 200 small distillers who use field stills ranging from comparatively primitive to conventional types and sell their oil either to larger distillers or commodity exporters. The best oil yields are usually obtained during July and September. Oil is graded according to eugenol content and Sri Lankan leaf oil specifies a maximum of 75-80% eugenol with a maximum of 5% cinnamic aldehyde. Distillation methods, soil and climatic conditions mean that eugenol content can vary between locations. ISO standards exist for leaf oil but not for bark oil. Cinnamon leaf oil production and exports are considerably greater than bark oil production and exports. Moreover, leaf oil production and exports are showing an upward trend despite annual fluctuations. In the early 2000s, exports fluctuated between 120-180 MT while during the last four years annual exports have averaged 262 MT with a peak of 309 MT in 2017 (see Table). As with bark oil, the limited availability of raw materials is affecting leaf oil prices and availability. In early 2018 leaf oil was trading locally at lower prices, but recently has risen quite sharply. Anticipating higher prices, distillers are reported to be holding onto stocks in anticipation of continued upward price pressure. A number of small producers and one large producer grow citronella in the southern regions, on approximately 1,300 ha. There are 2 to 3 harvests per year, and the citronella grass is sun-dried for about 3 days after harvesting prior to distillation. Distillation is undertaken in conventional field stills and yields average 0.7%, being higher in the dry season and lower in the rainy season. Annually Sri Lanka used to export several hundred MT of citronella oil but production has declined almost consistently over the past few decades, in part because of higher production costs and prices compared with Indonesia. Annual exports fell below 10 Mt in recent years but there was a substantial growth in 2017 to reach 38 MT (see Table). Some oil is consumed domestically in the soap industry. The recent very dry weather has had a major impact on the availability of grasses for distillation. Also lower Indonesian prices have limited demand for Sri Lankan citronella oil in recent years. Because of Indonesian competition the prospects for future growth of Sri Lankan citronella oil are not good and demand is restricted to niche markets that can support substantially higher prices. Oil prices in the local market have remained stable and are not expected to vary significantly. Cardamom production has declined sharply over the last 40 years and cardamom for distillation is limited due to high local spice consumption and Middle east exports. cardamom is cultivated as a mono-crop under forest shade in the central hills among the tea estates on an estimated 1,200 ha. the main season is october to December but small quantities are harvested throughout the year. Production from the eld to the cured pod is very labour-intensive and demands skill. Cardamom oil is produced on a small scale and is undertaken at distilleries in the Colombo region. Exports are under 1 MT and there is little prospect of developing significant export production levels in the short to medium term. Annual clove production and exports show wide annualuctuations, mainly because a good crop is harvested in alternateyears (see table). there are approximately 7,000 ha. 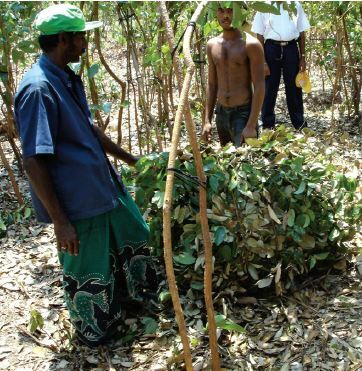 of clove and production largely arises from home gardens and mixed gardens in the central hills; the scale is much smaller than Indonesia or Zanzibar. Clove harvesting is a labour intensive and expensive operation and if the price falls too low then farmers will notharvest. Clove production in 2017 was not signi cant and a betterharvest is expected for late 2018. current availability of raw material is on the decline and farmers are holding on to stocks in expectation of better prices. Essential oil production is limited to clove bud and clove stem oils distilled in the colombo region. 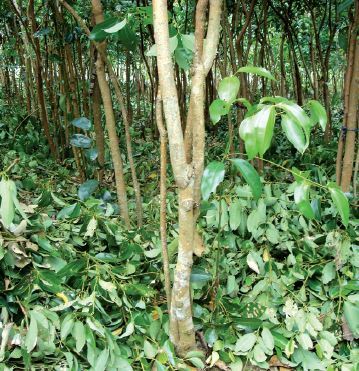 clove leaf oil production is not feasible with the highly dispersed, low intensity cultivation of clove trees. Both clove spice and clove bud oil have shown wide annualuctuations in recent years with annual clove bud oil exports below 10 Mt (see table). Prices of clove bud oil can be expected to rise from current trading prices. similarly, clove stem oil prices can be expected to stay rirm or rise further because of limited raw material availability due to the lower 2017 crop, combined with farmers holding on to stem stock in anticipation of price rises. Although not a native plant, nutmeg grows well in Sri Lanka and nutmeg oil is the largest essential oil export after cinnamon (see Table). Nutmeg trees are grown mainly in home gardens, along with pepper, cloves or coconut, in the central wet zone districts around Kandyand Matale, on an estimated 1,000 ha. Production is very small compared with Indonesia. A substantial proportion of production isexported either as spice or essential oil. Sri Lankan oil differs in composition from Indonesian oil in possessing a lower myristicin (3-4%) and higher sabinene content. Annual nutmeg spice exports have been relatively stable, but oil exports have shown wide annual variations ranging from 30 MT in 2014 to 122 Mt in 2016, with an annual average of 71 Mt over the past 4 years. nutmeg and mace are jointly produced products but it is thought no mace oil is produced. nutmeg harvesting will begin later this year, and currently no crop is available for distillation. Because of the dry conditions a smaller crop is predicted. Meanwhile, wet weather conditions in Indonesia have reduced raw material availability and it is expected that oil prices will remain rm and possibly tighten further. Sri Lanka is a sizeable and growing producer of pepper, estimates suggesting output in 2017 of around 25,000 MT from almost 40,000ha. Production is a mainly family activity in home and spice gardens in the central hills. the vines are grown on living trees and the shaded, low input cultivation of unselected cultivars, leads to lower yields compared with intensive high input plantation systems inother major producing countries. Nevertheless, efforts are being made to develop contract farming whereby growers are guaranteed afair price in return for delivering an environmentally responsible and sustainable product. The crop has a high proportion of light berries (about 5,000 MT in 2017), very rich in oil and piperine. For this reason Sri Lankan pepperhas always been favoured for distillation and oleoresin extraction. Also the oil has a distinct odour coveted by the perfume industry. oil distillation and oleoresin extraction is undertaken in the colombo region by modern factories. several companies distil black pepper oil,some of which is organically certi ed. In 2017 some 49 MT of black pepper oil was exported alongside 13,309 MT of pepper. The main importer of light berries is the oleoresin industry in India. In March India unilaterally imposed minimum prices on Sri Lankan pepper arguing that cheap Vietnam pepper was shipped to India via Sri Lanka under the Indo-Lanka Free Trade Agreement. Spice oleoresins are concentrated forms of the spice, using solvent extraction processes. The oleoresin closely matches the full avour pro le of the spice, in contrast to the essential oil, which only delivers a part of the pro le. Spice oleoresin use and trade has greatlyexpanded over the last few decades, particularly in the food industry, in part because the strength and other quality factors can bestandardised and controlled. Moreover, handling and transport is more cost e ective since the oleoresin yield is typically 10–15% of thewhole spice weight. Over a decade ago, Sri Lanka started oleoresin production for export, initially for western markets where food industry processing was centred. The major oleoresin product was pepper, partly because of Sri Lankan pepper’s high piperine level. However, Sri Lankahas been unable to compete with neighbouring India. Kochi in Kerala, some 500 km north of colombo, dominates world oleoresinproduction. Sri Lanka’s competitive disadvantage arises because of India’s substantial economies of scale relating to bulk extractionfacilities, alongside the ability to extract several large volume spice crops, including pepper, capsicums, turmeric and ginger. India hassubstantial domestic spice production and imports sizeable volumes of spices for further processing, including Sri Lankan pepper. Also India has a strong technical base. Sri Lanka is trying to create a competitive advantage by developing production of more specialistproducts – the further fractionation of the crude oleoresin, production of organic oleoresins for the organic food sector – but this is a relatively small niche sector. And finally – an estimated 1,500 medicinal plants are used in Sri Lanka, mainly in traditional Ayurvedic medicine, but major new markets are being developed by Sri Lankan companies in the food, beverage, supplement and cosmetic markets using the synergies betweenessential oils, spices and medicinal plants – but that’s another story!